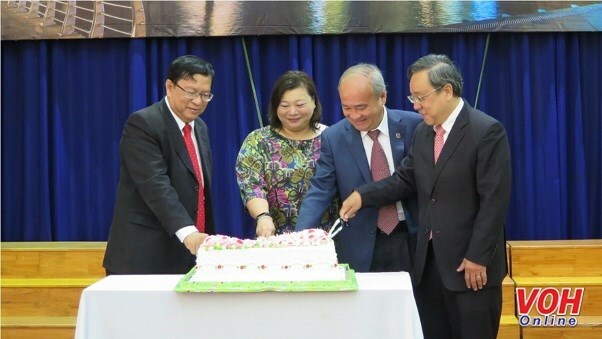 HCM City (VNA) – The Vietnam-Singapore Friendship Association in Ho Chi Minh City (VSFA) and the HCM City Union of Friendship Organisations (HUFO) on August 7 held a get-together to mark the 52nd anniversary of Singapore’s National Day (August 9). Addressing the event, VSFA President Nguyen Ngoc Hoa highlighted the fruitful traditional relations between Vietnam and Singapore, saying the two countries share many similarities in culture as well as concerns over national defence and security, peace and stability in the region and the East Sea as well. He also commented on successes of Singaporean businesses and investors in HCM City, which, he said, have demonstrated efforts made by the two countries’ governments to advance the bilateral ties. Singaporean firms in HCM City have also actively participated in social activities in the locality while joining hands in people-to-people exchanges, helping enhance mutual understanding between Vietnamese and Singaporean people and strengthen the bilateral relationship, he said. Leow Siu Lin, Singapore’s Consul General in HCM City, said the strategic partnership between the two countries has been intensified through the exchange of high-level visits of their leaders over the past time. The relationship is thriving across fields, especially in economy with the most noteworthy being seven Vietnam-Singapore industrial parks which are operating effectively in the Southeast Asian nation, she said. The diplomat also talked about the two countries’ cooperation in tourism, education-training, and social activities.